Due to the floods and lack of potable water caused by Hurricane Maria, leptospirosis has become a real public health concern for Puerto Rico. There are two suspected deaths due to leptospirosis and five cases with symptoms consistent with this disease so far. 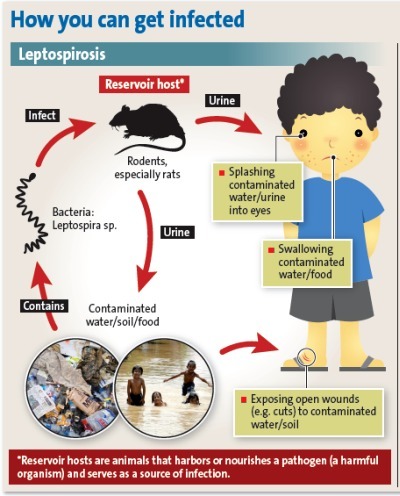 Leptospirosis is caused by bacteria. Infection occurs when people come into contact with surfaces, soil, water, or food contaminated with urine from rats, mice, and other infected animals. One can get infected through the nose, mouth, eyes and open wounds on the skin. In addition, the disease can be contracted by drinking contaminated water. DO NOT drink water that is not potable. If you have no choice, boil the water or add half a teaspoon of Clorox for every 2 gallons of water. Do not pick up debris without wearing gloves. Thoroughly clean all containers, cans or bottles in which you are going to collect, store or consume water before use. Do not walk barefoot outside. CAUTION: The symptoms of leptospirosis are VERY SIMILAR TO DENGUE, so ask your doctor to rule out the possibility of leptospirosis, as a misdiagnosis can be dangerous. Leptospirosis can be treated with antibiotics such as doxycycline and penicillin. Infected patients should be treated as early as possible. For people with a more advanced condition, treatment with intravenous antibiotics is recommended.